New England cops have solved the “crime of the century,” or so it seems: They have identified the man who relieved himself in a Vermont laundry. 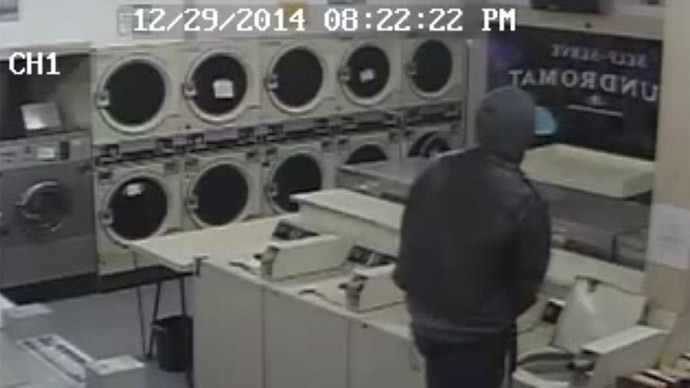 Steven Byrd, 29, has been dubbed the Washing Machine Urinator. Investigators are now trying to locate and question Byrd, who let it all hang out in the self-serve laundromat when he opened the lid of the washing machine and began urinating standing on a chair. When all was done, the man zipped up his pants, shut the machine’s lid and cleaned up some of the mess. Video of the December 29 incident was recorded by a surveillance camera inside the business, which was unattended when Byrd & a friend arrived. According to police chief Joby Feccia, the department received “dozens of calls” from the public urging police to identify the individuals at the Waterbury Laundry & Dry, The Smoking Gun reported. The business was unattended when Byrd and his friends arrived after 8 pm and “began throwing stuff around,” according to Feccia, who added that the department received “dozens of calls” about the incident. Byrd is likely to be cited for vandalism when detained.